So, what are you looking for in a hiking pole or walking stick? stay where you want them. have an inner foam lining that is very comfortable, easy on the wrists, and easy to adjust. for hard ground, rubber boot for flat surfaces, and snow disk for soft for muddy ground. *Backed by a 12 month warranty against defects in materials or workmanship. be screwed on the end of the pole, and they are designed for use when hiking in snow or wet or soft ground. 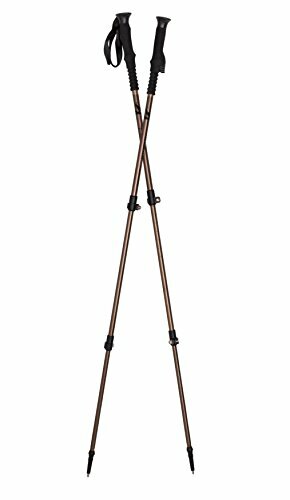 TELESCOPING LOCK-LEVER TREKKING POLES: These collapsible walking sticks are soooo easy to use. No messing around with twist-style locks that get stuck or slip. Adjustable tension flip levers assure your poles stay where you want them. PERFECT FOR HIKING: Add these great poles to your backpacking gear, and you will be all set for your next pack trip, camping outing, trail walk, anything you like to do in the outdoors. LIGHTWEIGHT AND COMFORTABLE: Each pole weighs in at just 10 ounces, and the soft foam handles are easy on the palm and fingers. The special formulation foam handles wick away sweat, never getting slick or hard to grip. The wrist straps have an inner foam lining that is very comfortable, easy on the wrists, and easy to adjust. TAKE THESE HIKING STICKS ANYWHERE IN CONFIDENCE: Whether you hike the Grand Canyon, Alaska, or just around the neighborhood, you will find these poles the perfect accessory for your trek. Backed by a 12 month warranty against defects in materials or workmanship. DETAILS: Includes 2 aluminum poles, weighing 10 ounces each, that adjust from 27 inches to 54 inches. Disassembled, pole length is 22 inches. Each pole has a durable steel tip for hard ground, rubber boot for flat surfaces, and snow disk for soft for muddy ground. If you have any questions about this product by Trekkr Campgear, contact us by completing and submitting the form below. If you are looking for a specif part number, please include it with your message.